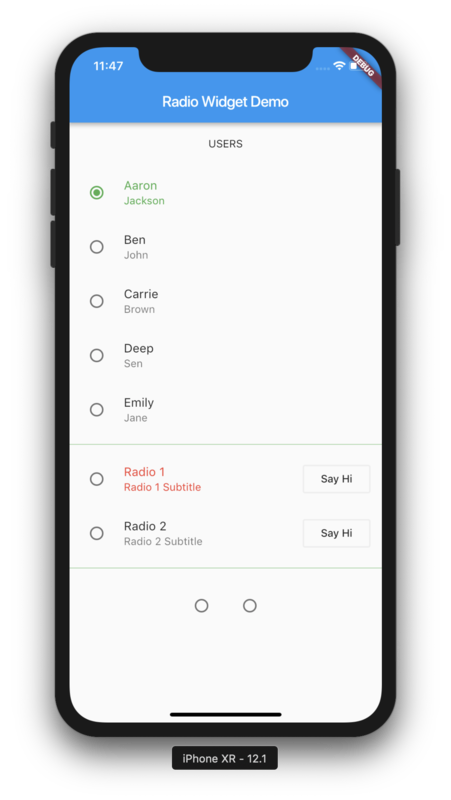 This article will explain how to use Radio Buttons in Flutter. 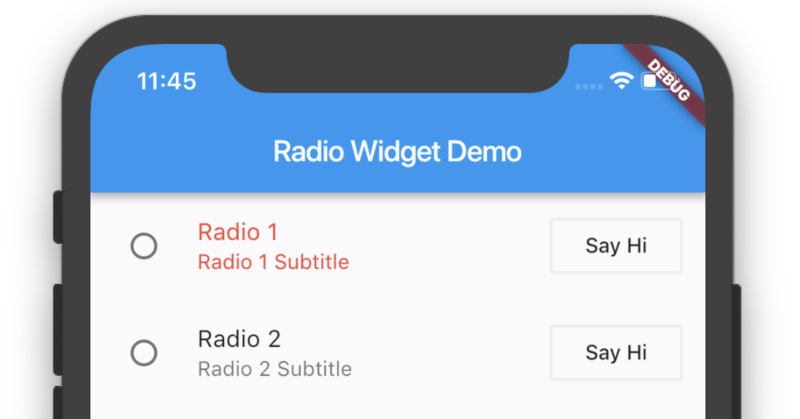 You can do this in flutter with the help of ‘Radio’ or ‘RadioListTile’ Widgets. The Below code adds two radio buttons to the UI. The ‘value‘ property is the value of each radio button. The ‘groupValue‘ property is the value that decides whether the radio button in the group should be selected or not. The ‘activeColor‘ property decides the active color of the radio button. The ‘onChanged‘ returns the current radio button’s value. The button changes to selected when the ‘value‘ and ‘groupValue‘ becomes equal. RadioListTile gives us more control over the normal one. It has additional ‘title‘ and ‘subtitle‘ property and a ‘secondary‘ widget. Here I am setting the ‘secondary‘ widget to an OutlineButton for now. Create a new file named ‘user.dart’ and copy these contents. Once that is done. Create a List<user> inside you class and initialize in the initState method. When the user taps each radio button in the list, it will trigger onChanged callback with the currentUser and it will set the global selectedUser object, which will match the corresponding groupValue in the list of widgets and when ‘selectedUser == user‘, that means when each radio button’s user value becomes equal to groupValue, it will become selected. The ‘selected‘ property changes the label color to the ‘activeColor‘, here it is Colors.green. Complete Source code is available in below links.